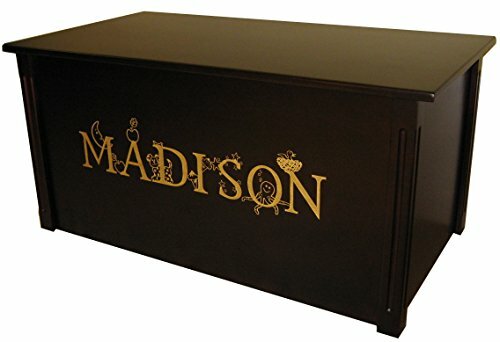 This classic handcrafted toy box (made by Wood Creations Inc.) features personalized engraving in the font of your choice. Included are must-have safety lid supports... whatever the position of the lid... it will not drop. Available in multiple finishes (see our store for other colors), this spacious wooden toy chest is perfect for any décor and provides clutter-free storage for stuffed animals, games, and toys. If you're looking for a one-of-a-kind handcrafted toy chest, look no further! 100% satisfaction guarantee. Fast turn-around time of 7-10 days from ordering to delivery with free shipping. Heirloom quality and built to last a Lifetime. Some assembly required. (With easy instructions in English!) produced in Bismarck, North Dakota. If you have any questions about this product by Wood Creations, contact us by completing and submitting the form below. If you are looking for a specif part number, please include it with your message.